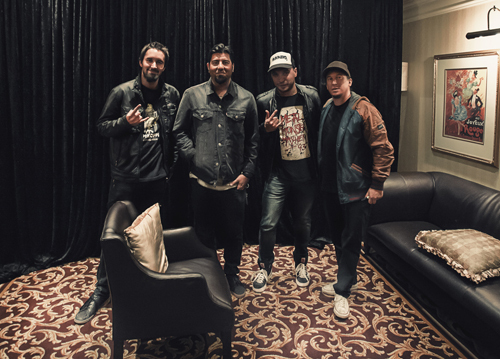 Shortly before blowing the doors off the Grandwest Arena with their explosive set in Cape Town, Chino Moreno and Abe Cunningham of the Deftones squeezed in some time to talk to us about finding inspiration, recording for themselves first and writing a new album soon. First off, thanks for coming to South Africa. How is your approach different in preparing for a stadium show (like this one) versus an outdoor festival like Oppikoppi? Chino: Nah, I mean we don’t really think about it too much in terms of being outside or inside. Musically we just try to cover as much of our catalogue as we can. This is kind of special to us as it’s the first time ever being here so we’re trying to play a little bit of everything. Still I am sure we’re going to leave stuff out that people are going to want to hear, but we’ll try our best. Are there certain albums or songs that are under-represented in your live sets or do you try to keep it balanced? Chino: We try to, but we have our favourites. Out of our collection of songs there are songs we like personally and we play them really well. There are some songs that are pretty much always in the set like ‘My Own Summer (Shove It)’ and ‘Change (In The House Of Flies)’. But really we try to get a lot of new songs in there too because they’re new to us too and fun to play. Your last album ‘Koi No Yokan’ was critically extremely well received. Has your approach to making albums changed? Does the album stand out for you personally or is it like picking between one’s children? Abe: We’re trying to keep it light and loose and fun, first and foremost. Over the years we’ve definitely gone through periods of tension that are well documented. But that’s just living life, you know? The past couple of records have been an example of where things have been much, much better and where we’ve been able to get down to it, all the while still having lives. But being able to knock it out, not rushing it for the sake of rushing it, having a goal and being able to accomplish that. You mention keeping it ‘light’ and keeping it ‘natural’. Do you ever feel pressure to push the music in a direction you have not done before? Or are these reserved for side projects like Team Sleep? Chino: No pressure. I think we like to do that generally because we appreciate different kinds of music. It’s not just like we have a formula and follow it. It’s fun for us to actually try and do different things. Even though I think we never really venture off too far… You know we try to stay true to the core of our sound that is pretty much guitar driven rock but there are all different elements of music that we listen to now. And we try to bring in our musical influences and try to do it so it’s not so concocted. We try to do it so it’s very natural, very organic. Do you ever come up with anything that doesn’t fit into the Deftones sound (for lack of a better word) or do you keep those ideas for side projects like the Team Sleep stuff? Chino: No, not at all. I honestly think that those songs that I do with that project or that anyone does with any other project can definitely fit in with what we do (as Deftones). I just think it’s different people and it ends up being a little different to this but I never think that this doesn’t work for this or doesn’t work for that. I think generally coming out of any one of us it’s genuine you know, it’s not contrived. 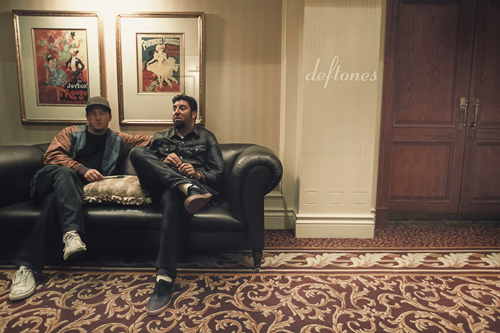 Abe: I think anything could work for this (meaning Deftones) and that is why it’s just a nice place to be. Chino: We found over the years with the records that we made we left ourselves open or susceptible to letting in others and to letting other sounds come in. Our first record was probably our most straightforward and aggressive album, but if you listen to it there are still some things on it that aren’t typical for a metal band. With every record I think we’ve explored that a little more every time. Is song writing still very much a collaborative effort? Do you all arrive in the studio with formed ideas and how does it come together? 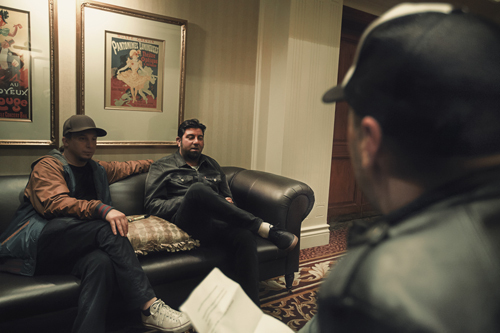 Chino: There were a couple of songs where ideas were formed and brought in but the majority (and especially the last couple of records) have been just us in a room where one person will start playing something and then everybody follows along and adds their own spice to it. 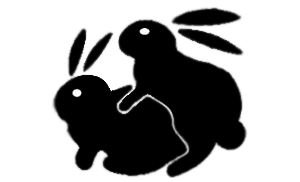 Abe: That’s the fun – the spontaneity and the collaboration. Chino: It’s good not to come in with preconceived ideas about what we want to do. That leaves it open to us to feel the moment that we’re in and give a snapshot of that moment. Then, when we look back at the album it just takes us back to that time and makes it special for us. Let’s talk about the pressures of record sales and fan appeal. Do these pressures feature in the creation process or is it rather about being true and people responding to that? Chino: I don’t want to sound insensitive but we don’t really think about the fans when we make records. Not to be disrespectful at all, but we’ve never really done that. We’ve always just done what sounds pleasing to us and usually it just works that way. It feels natural to us and it sounds natural to the fans. Despite countless new groups, a couple of nineties bands have released so-called ‘big’ albums recently, for example Soundgarden last year, Alice in Chains this year with a new Korn album out later this year, also Nine Inch Nails and so on. Care to share your thoughts on that? I feel like our band is a little different to some others. We still have that connection and there’s never been anything forced since the beginning, like it’s something we have to do. Abe: Some of these bands have been away for a long time too, like Soundgarden, but I think they were always a great band and it’s so neat to have them back. Chino: For us it feels to me like we’ve never really been away. I feel like we’ve been here the whole time. And to be this far into our career and have success on our latest record is just great. What are you looking forward to in SA? What are you expecting? Chino: I was just looking to come here, period. We’re excited to make it this far. It’s always good to go to someplace we’ve never been. We’ve been a band for 20+ years and to come to a new continent, a new country and a new city where no one has ever seen us before is exciting. What are you expecting from the crowds here? Any idea? Chino: I honestly don’t know and I hate to go in with expectations. We’re hoping it will be the greatest ever but we rely mostly on the hope that we play great. And if we play great, the crowd will be pretty receptive. Abe: That’s it. Just hoping for a good time, you know? Where would you say the craziest fans are? Except South Africa, of course. Who are the most passionate, loyal and devoted from your years of touring? Chino: I’d say South America. We seem to have a big Latin American following, also Mexico or even Texas (laughs). Latin America is pretty rabid for us, passionate and really big crowds as well. One last one. 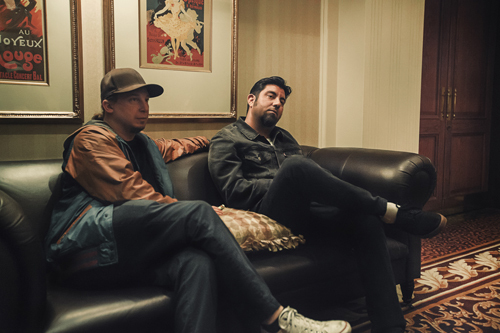 What is next for Deftones? Chino: This current tour is winding down at the moment and we’ve been going for about a year now. We’re taking good breaks in between but we plan on making another record, going in with the same mindset. You know, going in and recording what happens in that moment. We’ve been on a good roll the last couple of years so we’re just going to keep doing it. hoekom sal julle die fotos clickable maak as hulle nie groter oop maak nie?